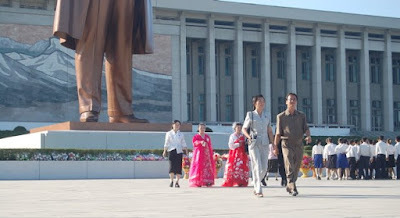 It is hard to visit North Korea with no pre-conceived notions. The secret state. That place ruled by the strange man with the even stranger hairdo. A man adored by millions. A man said to be intent on pushing the world to the brink of nuclear disaster. Whacky, was a word someone once used to describe the Pyongyang International Film Festival. And whacky was what we half-expected when we first arrived. But after 12 days – some spent immersed in intense propaganda and extreme displays of deference to the Dear Leader – we leave with a wholly different perspective of the country. We leave with a deep admiration for the friends we made during our stay in Pyongyang – for their warmth, their commitment to their country and their unwavering belief in their political system. We might disagree. Yes, we think their faith a little hard to comprehend. But it is hard not to admire their conviction. And the festival? It was an experience like no other. Enlightening at times. Bizarre at times. And organized by some of the most hospitable people we’ve ever met. 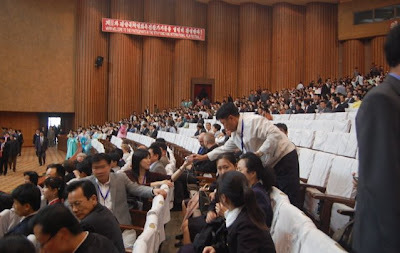 In Pyongyang, we got to know participants who’ve made it a point to return festival after festival. One guy from Germany told us this was his fourth time there – he gets to see his North Korean friends once every two years. Another, a Professor from Sweden, has visited for the past ten years. Why? It’s hard to explain. This is a festival where you’re constantly supervised. Where you’re not allowed to walk on the streets on your own, take a taxi without a guide, or even step out of the hotel alone. The constant handling can be un-nerving. The being hustled around, a bit of a pain. But by the end of the trip, we too, were planning to return next time round. The festival is special in a way that’s hard to describe. We’re in Beijing now. Trying to process the whole experience. More updates and photos soon.